So some people have been asking about starting running, especially after my post of losing 20 pounds since May just by running. Don’t make me out to be a fitness guru, or anything like that, I still eat pretty horribly, but running anywhere from 20-50 miles a week really helps me in all aspects of my life, especially with getting back into shape. I feel more energized, sleep better, and overall have a more rosy outlook on life. It allows me time to think, sort out many thoughts in my head, and just enjoy being outside. On the other hand, many people they never think they will be a ‘runner’. Believe me, I never thought I would be able to run a 1/2 marathon, but I finished two, and am already looking for more to enter. Running is fun, and you have to choose to make it fun, and not see it as being so negative, and a chore. Once it reaches that point, you won’t enjoy it, and that means you won’t do it. So the first thing you need to think about when running is your mindset. So many people always tell me, “Wow, you can run that far! I could never do that,” or a classic is, “I hate running.” or “I can’t run.” Come one people, cut yourselves some slack here! You CAN run, but just like anything else in life, you have to believe that you CAN do it. If you go into the run with the thoughts of, I’m going to hate every single minute of this, of course you are. This might be a lame comparison, but when I started driving, I was deathly afraid of it. Of course now, I’m not and I drive everywhere, but it just shows that when you start anything in life it can be scary. Use that fear in a positive way. When you start out it’s not going to be easy and your not going to be putting in 15 miles or even maybe a mile on your first run, but believe me, the results are great, and who doesn’t want to be healthier? Starting is the hardest part of so many things in life and allowing yourself the chance to like it can lead to great things. What if you never went on a first date with your husband? Or what if you never took that job offer? What if you never started running? Also it’s a great way to get out in your community and experience some great nature. Many of you live in AMAZING areas, (I can tell by your pictures and I’m so jealous) and taking advantage of that would allow you to see some great things. I run in many yucky, all concrete areas, and just to be able to go to a place where you guys live would be a dream come true. You have the chance to run it already! It’s in your backyard so take advantage! I know this sounds cheesy, but I’ve seen some of the absolute best and breathtaking sunsets and sunrises out on my runs, and these alone are so inspiring. I also can’t promise you addiction to running, like myself, but give yourself a chance. Not everyone who runs is immediately drawn too it. So a little background of my personal running career. I started running in 8th grade when I wanted to run for the middle school cross country team. It was a great experience and I felt like it was something I was good at and I enjoyed it. Freshman year I went out for the high school team and was on the team all four years. In winter, I played soccer and in spring I ran track. Running was always apart of my life since then and I wanted to run in college, but my summer before I started, I hurt my knee and they recommended knee surgery. I was kind of over it then, I think, mostly I was burnt out, and so I gave up racing competitively. I ran on and off throughout college, and within the past year have really started to work at consistently running again. I started looking into running a half marathon, though I thought that it was WAY, WAY to far for me, and I wouldn’t be able to do it. I was only running 3-5 miles for my longest runs, and I knew that 13 was a long way from my measly 3 miles. I decided to sign up for one in Long Beach that was five months away and found a training site that I thought seemed to fit what I was going for. This leads me to a huge part of running. MAKE A GOAL! Once I made the goal, I couldn’t stop running. It was a bizarre change, but one weekend I ran 8 miles for my long run, then the next was 8.5, and soon I was up running 12, and 13 miles. I shocked myself, but it was almost that if I told myself I absolutely had to do it, because I already signed up for the 1/2, then I HAD to do it, and I would go out and do it. Weird how my little brain works. Sign up for a 5k (3.1 miles) fun run or run/walk, or a 10k (6.2 miles). Make a goal and stick too it. Once you have a goal, you’ll be much more into training for it. Also if you sign up for a race, you’ll see a bunch of fun crazy people at the race, and they encourage and inspire you so much! People running in costumes, barefoot, the whole 10 yards! Make running fun for yourself, and reward yourself. Believe me, after a long run, I eat as much Taco Bell as I can that day. I get cute new running clothes when I can, and make running something that everyone in my life knows I do and enjoy doing it. Download some workout songs on your ipod (I’ll post some personal favorites soon) and just go out and get pumped up. You can even watch the classic Prefontaine movie (we used to always watch it before meets for cross country), or Rocky. Get a sports massage every now and then, and enjoy running, don’t pound yourself into the ground over it. Subscribe to Runners World and read super inspiring stories in there about other runners. I do recommend running to get back into shape or to start getting into shape. It’s really relaxing and fun, once you get used to it and keep with it. I know the key to running is consistency and so therefore I’ve included a few links to some sites that I think will help some beginning runners. Another huge part to beginning running is no matter how good you feel, follow the guidelines and stop when you have completed the beginning work outs. Running puts a lot of different stresses on many different parts of your body. Believe me, I still get sore, but just because you feel good and you’ve jogged for a mile, doesn’t mean go for three more. To begin, start out slow and just keep building on your mileage. Start out by walking, then switch to running and walking, but just remember to go slow, don’t go out and run three miles the first day out, because the next day you’ll associate all your pain with running and it will make you never want to do it again. 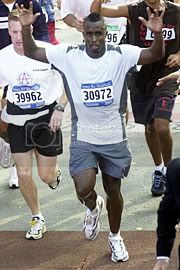 I mean, if you think about it, Katie Holmes, Oprah, President Bush, P-Diddy, and Will Ferrel have all run a full marathon. That’s 26.2 miles. If they can do it, anyone can! 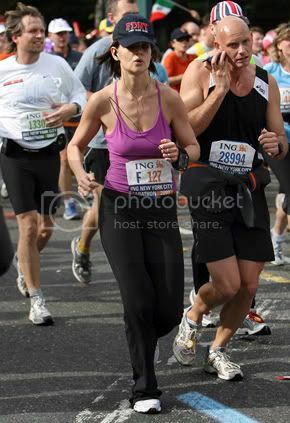 I also read that Will Farrell’s wife is a multi-time marathoner and she paced him. He tells funny stories about running along with her saying “Look honey – it’s the Empire State Building!” and him responding “GREAT, WONDERFUL! SO WHAT??! !” because she was just loping along and he was in pain. Katie… ummm, nice chest bones? Okay I admit I’m jealous. 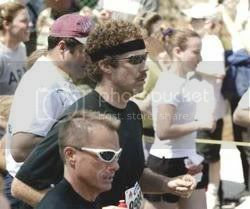 This makes me love Will Ferrell even more! What is he wearing!? The Couch to 5k Plan has a lot of great ideas and I think would really benefit any beginning runner. Also the Many Schedules on the about.com have a lot of “levels” for the advanced beginning to the never run before beginner. Also Marathon Training has a FAQ section which could help a lot for beginners. I know going to the gym and running on the treadmill can be addicting, and you feel like you are running outside, but I would really recommend going outside and running. It’s SO much different that being on the treadmill and if you train only on that, it will be much harder to run outside, especially if you want to run in an actual race. If you can only run on a treadmill, try to go outside as much as you can, but I know sometimes the weather does not permit, even I run on the treadmill every now and then.